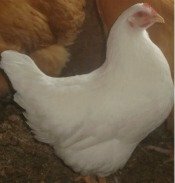 Although not as popular as their cousin the red, the Rhode Island White chicken breed is a good dual purpose bird for backyard chicken growers. They are cold hardy, friendly, and adaptable. Size: Standard Male: 8.5 Ibs. / Standard Female: 6.5 Ibs. / Bantam Male: 34 oz. / Bantam Female: 30 oz. Comb, Wattles & Earlobes: They have a medium-size rose comb, wattles, and medium-size oblong earlobes. All of these are bright red. Color: They have a yellow beak and reddish bay eyes with yellow shanks and toes. They have standard white plumage. Special Qualities: They are a great dual purpose bird. This is a separate breed from the Rhode Island Red. The White was developed in 1888 in Peacedale, RI, by John Alonzo Jocoy, a renown poultry farmer. He crossed Partridge Cochins, White Wyandottes, and Rose Comb White Leghorns to get a good dual purpose bird. The hens do not tend to go broody. The breed has a laid back disposition and tend to mature early. They are fairly hardy and usually do well in both confinement or free range situations, much like the Red. The White and the Red are often bred to produce what is known as "Red Sexlinks," which are used by commercial brown egg operations. In these sexlink birds, the males are white and the females are red with a white under color. The White was first recognized by the APA in 1922.